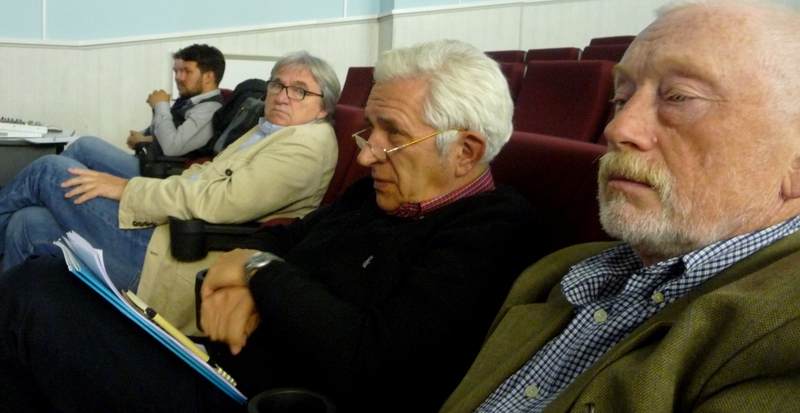 A public hearing on a radioactive waste conditioning center and an environmental impact report on its operation at Sayda Bay in Russia’s north last week failed to draw much interest from locals. The materials presented from the environmental study for discussion at the hearing were geared toward granting an operations license to a stationary installation intended to store, handle and process radioactive was at Sayda Bay’s radioactive waste conditioning center. The center will be operated by SevRAO, a branch of Russia’s state radioactive waste handler RosRAO. The hearing was timed for convenience at 5 pm on a Friday afternoon, but only drew 18 audience members, including its organizers, speakers and Bellona representatives. Organizers said they had made all materials to be discussed at the public hearing available beforehand at the city administration building. But aside from organizers, no one who attended had paged through the documents. Alexander Nikitin, chairman of the Environmental Rights Center Bellona chalked up the apparent disinterest in the hearing to the fact that the radioactive waste conditioning center isn’t especially dangerous. “There are no nuclear materials at Sayda Bay so there is no alarm about possible nuclear accidents,” Nikitin said at the hearings. “People understand that this installation in comparison to such things that are dealt with at the [nuclear naval shipyard] Nerpa [near Murmansk]. He cited as one the dismantlement of the Lepse, a former nuclear icebreaker refueling ship, containing 639 spent nuclear fuel rods, many of which are damaged. The ship was until it was moved in 2012 from the Atomflot port in Murmansk to the Nerpa shipyard for dismantlement one of the biggest radioactive hazards in Northwest Russia. He said that the Lepse posed a much higher level of radioactive danger. The task of the radioactive waste conditioning center at Sayda Bay, as discussed at the hearings, is to accept radioactive waste from Northwest Russia’s dismantled nuclear submarines and other nuclear vessels, as well as other forms of solid radioactive waste that have long piled up on Arctic shores at old bases. The center will temporarily store the waste and prepare, or condition, it for further shipment for internment by Russia’s newly-minted national operator for radioactive waste handling, known in its Russian acronym as NO-RAO. Sayda Bay’s radioactive waste conditioning center can hold 10,000 cubic meters of solid radioactive waste. Valery Yermenko, chief engineer at Northwest Russia’s division of SevRAO, sai the Sayda Bay conditioning center has already received licenses to perform other various crucial tasks. To date, Yermenko said the facility is licensed build, equip and decommission nuclear installations, radiogical installations, and sites for storage of radioactive substances and waste. It is also permitted to nuclear and radioactive materials to provide nuclear power to defense related projects. Yermenko specified that last weeks public hearing was to achieve a license for handling civilian radioactive waste. 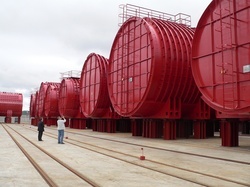 According to the plans for the radioactive waste conditioning center and its long-term radioactive waste storage facility, it will be licensed to accept solid radioactive waste that’s transported to it from various sites in Northwest Russia; process and keep solid radioactive waste in storage; be permitted to store on a long-term basis parcels of solid radioactive waste, and to treat secondary radioactive waste. According to the licensing application materials, the installation at Sayda Bay is preferable for its task. The document’s authors examined the question of long-term storage in other areas of the Murmansk Region and discussed why these areas were turned down. “An analysis of the qualities and insufficiencies of suggested alternative variants at which to implement the activities of operating stationary installations intended for long-term storage of radioactive waste and handling radioactive was showed that [Sayda Bay] was the most preferred for the realization of such activities from the point of view of legal, economic, environmental and consequential considerations,” the licensing application reads, in part. According to the environmental impact study, the center’s effects upon the surrounding ecology are acceptable. Additionally, decisions relative to storage and rational use of water resources will prevent contamination of nearby water resources. Studies of possible air contamination also concluded that any atmospheric contamination within the installation’s buffer zone would not be expected to reach levels above norms. The environmental impact report concluded that these technical decisions minimize possible negative impacts on humans and the environment both during ordinary functioning and any incidents arising from its operation. Sergei Zhavoronkin, secretary for the public council on the safe use of nuclear energy in the Murmansk Region said the installation didn’t cause him any apprehension about risks, even when the center itself is packed to capacity. Bellona’s experts voices a number of small concerns about the licensing materials, which will be added to the document as corrections within 30 days.